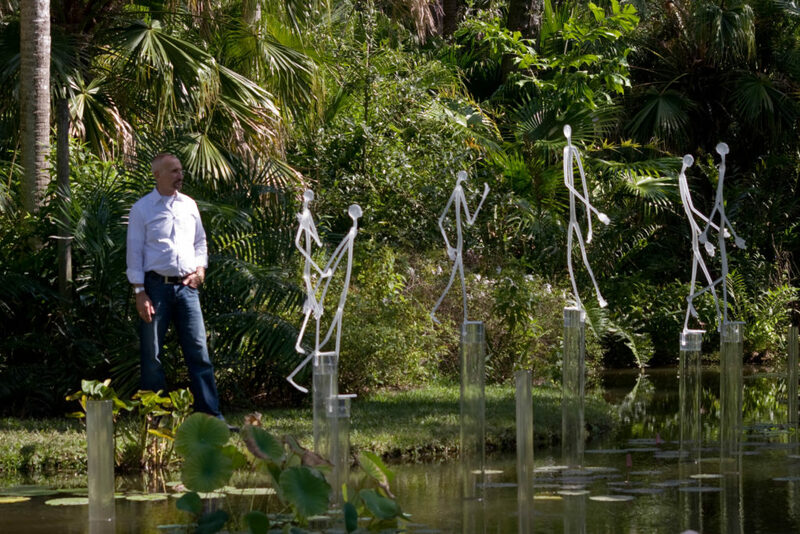 Reflections on Glass: Fräbel in the Garden brings a collection of whimsical glass sculptures and installations by flamework glass artist Hans Godo Fräbel to Naples for the first time. This whimsical exhibition features botanical pieces, playful figures, and ornate geometric shapes. Long regarded as one of the most influential flameworkers in America, Fräbel has been an important part of the evolution of flameworking into a recognized and respected art medium. His works can be found in public and private collections in over 80 countries worldwide. To accompany the exhibition, learn more about the life and art of Hans Godo Fräbel in the Emmy-nominated PBS documentary Transformed by Flame – The Glass Art of Fräbel. It will be on view in Kapnick Hall throughout the exhibition, unless a special event is taking place. One-of-a-kind pieces of Fräbel glass will be available for purchase in the Berger Shop in the Garden. Members can learn more about the Member Opening of Reflections on Glass: Fräbel in the Garden by clicking here. Reflections on Glass: Fräbel in the Garden is on view from October 1, 2018 through March 31, 2019 and is included with regular admission.